← Report from the North by Al Dronsfield!! 2018 02 27. Ruth Addison Has Left Us; May She Rest in Peace. Coldwater Shuffleboard are saddened by the passing today of their Grand Lady of Shuffleboard , better known to everyone as “Gramma”. Ruth Addison passed away today in her 103rd year and leaves behind a wonderful legacy for the shuffleboard players of Coldwater. Ruth was probably one of the more skilled and no doubt one of the most experienced players in the Coldwater Club. 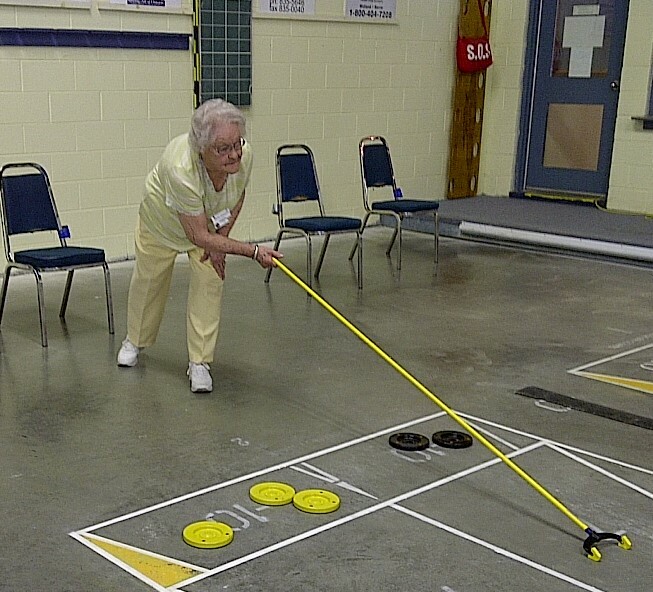 At the young age of 98 Ruth still played on a regular bases and could outwit and outplay many younger players with her uncanny knowledge of the game of shuffleboard. Ruth was born in Oro Township which is located between Orillia and Barrie Ontario, on Jan 1st 1916 and attended a one room school at RR #8 Oro . Ruth was married to Claude Addison in 1938 and her and Claude lived their entire life in the Orillia area where they raised two daughters Carol O’Reilly and Patricia Brown, and have 4 grandchildren and 6 great grandchildren . Later in her retirement years Ruth took up the game of shuffleboard in Clearwater Florida at a place called Skylark Park where she and Claude spent their winters for more than 25 years. 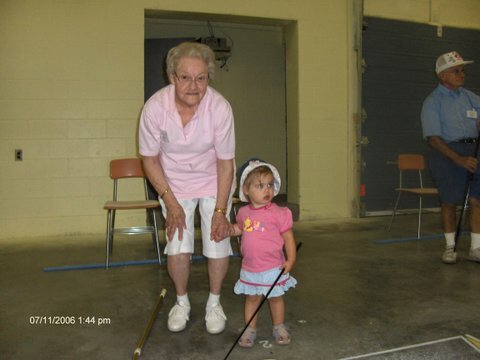 Ruth always looked forward to travelling over to Coldwater twice a week with her daughter, or son- in -law and enjoyed the fellowship and the exercise both mentally and physically the game of shuffleboard had to offer. Ruth was the mother-in-law of George O’Reilly who is a past president of the Ontario Shuffleboard Association and also a Past President of Coldwater Shuffleboard Club. Funeral arrangements are being entrusted to the Mundell Funeral Home 79 West St Orillia . The photo with “Gramma ” Ruth and the little girl above was taken in Aug 2006 and the little girl is the great granddaughter of Ross Pipher . 1 Response to Ruth Addison Has Left Us; May She Rest in Peace. A very sweet lady…May she Rest In Peace.